Why did Rand Choose Inventor as Galt’s Profession? Dale B. Halling, author of Pendulum of Justice (with his wife Kaila) and The Decline and Fall of the American Entrepreneur, will be speaking at the Atlas Summit 2014. The topic of his talk will be “Why did Rand Choose Inventor as Galt’s Profession?” The paper below roughly tracks the talk. Rand stated that the goal of her writing was to portray an ideal man and Galt was her artistic embodiment of the ideal man. In the famous Galt speech, he says “I was an inventor. I was one of a profession that came last in human history and will be first to vanish on the way back to the sub-human?” What is so important about inventors that Rand would make that the profession of her ideal man and indicate that the profession of inventing was the canary in the coal mine of human progress? In order to answer these questions, we first have to define what an inventor is: it is a person who makes their living from creating and selling inventions, as opposed to manufacturing, marketing, distribution, etc. We all think we know what an invention is, but actually courts have struggled with this question. In the last couple of years the Supreme Court has heard a couple of cases on this exact question and has provided no clear answer. Dictionary definitions tend to be circular or so vague as to not be helpful. I am going to propose that an invention is a human creation that has an objective result, i.e, the effect of which is demonstrable repetitively, and measurable objectively, and independent of the observer. While art is a human creation that has a subjective result, i.e., whose effect is the reaction of the observer, which not only varies from observer to observer, but may also vary over time in the same observer. Art and inventions together are the complete set of human creations. For instance, the invention of an incandescent light bulb has the objective result of putting out light when the appropriate electrical signal is applied. Note that inventions are always about a class of objects, not an individual object (instance). Art does not have an objective result. How I react upon seeing Atlas Shrugged III will be different than how you react. This can become confusing, because movies are an invention. A specific instance of a movie is a human creation with a subjective result, while the class of objects called movies is an invention, actually a modern movie is a combinations of many inventions. Manufacturing is the process of recreating an object. If I produce a hundred bikes, I have recreated the invention of a bicycle a hundred times. Standard engineering involves repurposing an invention. For instance, if I am making bikes for adults and I decide to make them for children; I know children are smaller so I will design a smaller frame, I might design the frame out of thinner steel because kids are lighter, I might change the gearing because kids are not as strong, but in the end it is still a bicycle and not a new invention. Neither manufacturing nor standard engineering meet the definition of an invention. Rand has a scene in Atlas Shrugged between Jim Taggart and his wife that gets to the essence of what an invention is and many of the debates about inventions. This scene clearly illustrates that Rand understood that an invention is a combination of existing or known things and it is the combination that is unique. We know this is true because you cannot create something out of nothing and this is James Taggart’s reason for saying Rearden did not invent anything. Cheryl’s responses is also classic in pointing out that all the things necessary to create the invention were available to others, but only Rearden created the metal. Rand stated, “I seem to be both a theoretical philosopher and a fiction writer. But it is the last that interests me most; the first is only a means to the last.”  She described Galt as, “He too, is a combination of an abstract philosopher and practical inventor.” She illustrates this point in the scene where Dagny goes to talk to Dr. Stadler about the motor. Stadler states, “Why did he want to waste his mind on practical appliances?” Dagny replies, “Perhaps because he likes living on this earth.” For Galt philosophy and theoretical physics are a means to inventing, with inventing being the primary goal. According to the definitions of art and invention above, all of human creation is divided between the two. This makes Galt the mirror image of Rand and together they make a complete set, which is why I think Rand choose inventor as Galt’s profession. Why are inventors important? Rand stated “Nothing can raise a country’s productivity except technology” and inventors are the ones who create technology. In classical economics we are taught that the inputs to the economy are land, labor, and capital. Robert Solow received the Nobel Prize in economics for an econometric study of whether labor, capital, or technological change had the biggest impact on economic growth. He found that almost all economic growth is due to new technologies, i.e., inventions. Follow up research has found that all real per-capita economic growth is due to inventions. Imagine if we had the same technology as the people living in 1600. Would we be any wealthier than the people at the time? The cotton gin is an interesting example of the power of inventions. In 1791, the entire output of cotton in the U.S. was 4,000 bales. The cotton gin was invented in 1793 by Eli Whitney. By 1801, the output of cotton in the U.S. was 100,000 bales, over a 25 fold increase. This increase was only possible because of the cotton gin. Note that this is consistent with Rand, who stated “Man’s mind is his basic means of survival.” The way man uses his mind to meet his needs is by creating things, i.e., inventions, and this has been confirmed by econometric research. Despite the importance of inventing, there have been very few professional inventors throughout history. One time period that we do remember for its professional inventors is the beginning of the Industrial Revolution through the late 1800s with Edison, Tesla, Westinghouse, and others. Why did this time period have so many professional inventors? An inventor is someone who makes his living by selling his inventions. In order to be able to sell an invention, you need to have property rights in your invention. Property rights for inventions are a relatively recent legal concept. The first known patent statute (property rights for an invention) was enacted, in 1474, by Venice. Note that Venice was one of the richest places in the world at the time and home to many great inventors including Leonardo da Vinci and Galileo. England slowly developed an archaic patent system starting with the Statute of Monopolies of 1623. Even this archaic patent system was enough to spur inventors to create the Industrial Revolution. The United States and the Colonies had patent systems roughly modeled on England’s. The (original) US Constitution only mentions one RIGHT and that is the rights of inventors and authors, i.e., patents and copyrights. It was not until the Patent Statute of 1836 that the US created the first truly modern patent system. A modern patent system is characterized by an examination system administered by an independent, technically competent examination core that is readily accessible to all inventors (as opposed to only wealthy or politically connected inventors, see England in 1800s), has a system for widely publishing patents, and provides a freely alienable property right. This is why we do not see the profession of inventing until relatively recently. Before a modern patent system an inventor had nothing to sell, which is why the Middle Ages are characterized by trade secrets passed along by guilds. I do not find it surprising that property rights for inventors were one of the last to be created. A nomadic society has no need for property rights in land and history shows that the concept of property rights in land is unfathomable to them. For instances, here is a quote by an American Indian that illustrates my point. Nomadic people gather, they do not cultivate. As a result, a nomadic people cannot possible understand why they cannot pick an apple from your orchard. Only with the agricultural revolution (and mining) did the concept of property in land make any sense. It would be impossible to have an agricultural revolution in which people who planted and cultivated the crops were not given the rights to the harvest and the land which they turned into a productive asset. Similarly the concept of property rights in inventions is difficult for people who see all wealth as coming from agriculture. For an agricultural people wealth is the result of physical labor, not thought. Sure labor saving devices are great, but they are meaningless until some puts the labor into using them, much like raw land in their minds. Putting this in more modern language, you can own an instance of say a plow, but cannot possibly have an ownership right in an instance of a plow you have never seen and did not build. Note the similarity to Marx’s labor theory of value. This chart shows the income per capita from 1000 BC to approximately 2000 AD and is most representative of the US, England and the West. It also illustrates the importance of property rights for inventions. 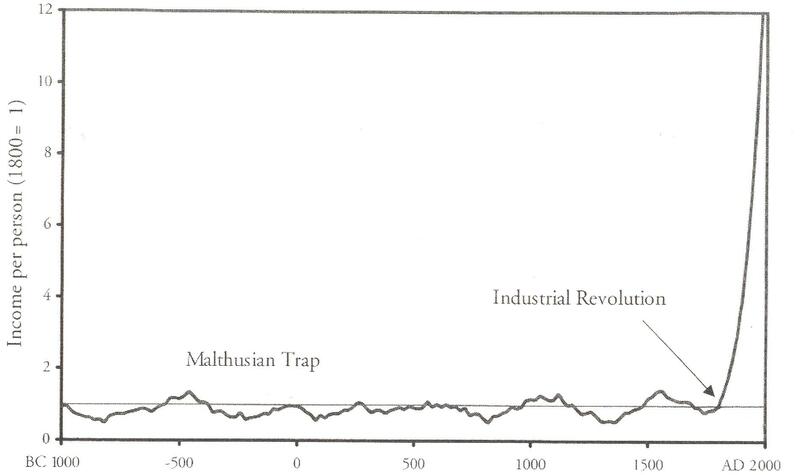 Until the Industrial Revolution around 1800, people were stuck in the Malthusian Trap, which means they lived on the edge of starvation. With the advent of relatively effective property rights in inventions, per capita income started to grow exponentially. Note this occurred with an exponentially growing population. This is not surprising. Economic growth is due to inventions and the advent of property rights in inventions spurred people to invent more. The same pattern with real property has been well documented, for instance see the Peruvian economist Hernando de Soto. Rand wrote in 1967, “Today, patents are the special target of the collectivists’ attacks …” She was right then and she is right today. In the 1970s the FTC (Federal Trade Commission) published their nine no-nos on patents. These severely limited the patent rights of inventors in the 1970s. Xerox was an example of this attack on patent rights and success. In the early 1970s Xerox was sued by the FTC for monopolistic practices. The inventor of xerography, Chester Carlson, was a patent attorney who started work on his invention in the late 1930s. He pitched his idea to IBM, Kodak, and many others and was turned down until the forerunner of Xerox. They spent years perfecting his idea and in the 1950s the Xerox started developing and deploying a commercial version of the copy machine. By the 1960s Xerox was one of the most successful corporations of all time. Xerox initially thought the FTC allegations baseless, but several years later with mounting private antitrust lawsuits Xerox decided to settle with the FTC. In 1975 when Xerox agreed to the FTC consent decree, which required them to license their patents for next to nothing to all comers, they had almost a 100% market share in plain paper copiers. Just four years later, their market share was down to 14% and most of the rest of the market was controlled by Japanese companies. While this was the most dramatic example of the FTC’s and Department of Justice’s (DOJ) abuse of U.S. companies’ property rights in technology, it was hardly an isolated incident. The FTC/DOJ brought more than 100 of these cases and gave away the technology associated with over 50,000 patents. The result was that the U.S. transferred its cutting edge technology to Japan and many U.S. companies found themselves unable to compete with the Japanese, because the Japanese did not have to spend the money on R&D or the large initial cost of marketing for a new product. A MITI study substantiates that most Japanese companies took advantage of this traitorous policy by the U.S. government to catch up with U.S. companies technologically. Once again Rand proved herself prescient. American companies’ response was to forego obtaining patents in the 1970s and this did not change until the 1980s. In the late 1990s there was a renewed attack on inventors. Instead of using antitrust law and going after large corporations, the new attack has been a crony capitalist scheme to create a playing field that only benefits large, politically connected companies. Among the many changes to US patent laws since 2000 are the requirement that all patent applications be published, the change from a first to invent to a first to file patent system, the Supreme Court not allowing patent holders to enforce their rights through an injunction, and the introduction of three different systems to attack the validity of a patent administratively. This is a more focused attack on the profession of inventing than the assault of the 1970s. In the late 1800s 85% of all patents were licensed by their inventors in the US. Late 19th century U.S. inventors increasingly operated as independent inventors who extracted returns from their discoveries by licensing or selling their patent rights. Among these inventors were Edison, Bell, Tesla, etc. “An astonishing two thirds of all America’s great inventors in the nineteenth century were actually NPEs” (Non-Practicing Entities). Today’s system makes the cost and uncertainty of inventing far too risky for all but the most wealthy inventors. Most large companies practice a policy of purposeful ignorance of other people’s patent rights and rely on the fact that litigation is too expensive for independent inventors and small companies to prevail in court. If you asked the success rate for independent inventors (People who just create and sell their inventions) to people in the industry, you would hear somewhere around 2%. But as Rand pointed out the attack on patents is not limited to socialists. There has been a concerted attack on patents by Libertarians and Austrian Economists. One of the best known proponents of this point of view is Stephen Kinsella. They argue that property rights are not about creation, not about owning yourself and the product of your labor, but about scarcity. According to them, patents and copyrights create artificial scarcity. Their argument fails even if you believe that property rights are based on scarcity, because it takes real resources to create inventions and real resources to distribute these new technologies. The press has also joined in this all out attack on patents, labeling anyone who does not manufacture their invention a “patent troll.” This attack includes so-called free market media outlets including Forbes and the Wall Street Journal. These attacks ignore Adam Smith’s idea of the division of labor, ignore that many of our most revered inventors in history meet their definition of a patent troll, and ignore that many large manufacturing companies enforce or license inventions that they do not manufacture. But the goal of these articles is not logic, but to create a narrative to eliminate the profession of inventing. The legal attack on the profession of inventing is not limited to destroying the property rights of inventors, but also includes limiting inventors’ access to capital through laws like Sarbanes Oxley. However, the people who hate human progress and hate humans are not content to just stop inventors, the engine of human progress, they want to roll back the technology of the last two hundred years. For instance, they want to outlaw DDT, they want to outlaw fossil fuels, and they want to outlaw private vehicles. Environmentalists have the stated goal of forcing humans back to the state of “sub-humans”, meaning people without technology. This is why Galt said his profession, inventor, would be one of the first to disappear on the way back to the sub-human. The first step in this process is to stop new technologies from developing and the second step is to roll back the technology that has already been developed. All human creations can be divided into art and inventions, with one having a subjective result and the other having an objective result. Rand was an artist and philosopher, while Galt was her mirror image of an inventor and philosopher. Inventions are the result of man’s mind trying to fulfill his needs. Property rights for inventions are a fairly recent development and correspond generally with the escape of mass numbers of people from the Malthusian Trap. This has made patents a key target of those who hate human progress. This presents and opportunity for the Atlas Society and Objectivist to differentiate themselves from other so-called free market organizations and to stand up for the Galt’s of the world. This talk is a small part of the work I have been researching in what economists call ‘New Growth Theory.’ This area of economics recognizes the central nature of man’s mind in producing wealth. As a result, it presents the possibility of being able to define a school of economics that is consistent with Objectivism. Rand, Ayn, Atlas Shrugged, Introduction to the 35th Anniversary Edition. Evans, Harold, They Made America, Little, Brown and Company, 2004, pp. 49-50. Lemly, Mark A., “The Myth of the Sole Inventor”, March 2012, Michigan Law Review, http://www.michiganlawreview.org/assets/pdfs/110/5/Lemley.pdf. Mark Blaxill, Ralph Eckardt, The Invisible Edge: Taking Your Strategy to the Next Level Using Intellectual Property.